Norwich City’s record signing Ricky van Wolfswinkel marked his Premier League debut with a bullet header that earned Norwich a point in a thrilling 2-2 draw. After a tight first half, Steven Whittaker opened the scoring six minutes into the second, finishing from a tight angle after his own shot hit the post. Everton turned the game on its head in four minutes. Ross Barkley found the net with a beautiful drive from 25 yards – the pick of the goals – before Seamus Coleman tapped in from close range. 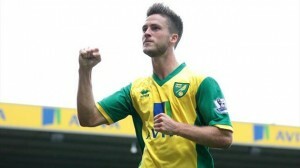 But Van Wolfswinkel headed a deserved debut goal to ensure the opening day points were shared.